I’m thrilled to announce that I’m joining The Washington Post’s newsroom next semester as an American University School of Communication Dean’s Intern. In other words, for five months next semester, I will be a (paid) reporter for the Metro section of Washington’s best and biggest newspaper. Words can’t describe how excited I am for this opportunity to hone my journalistic craft in the city I adore at a paper I revere. It’s the same paper that took down a president, exposed the horrors of Vietnam, and day-by-day brings the goings-on of the nation’s capital to the American people. The team I will work with is incredible. 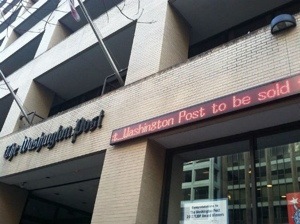 I’m proud to call many journalists at the Post friends and colleagues even before my first day. I’ve also reported (and opined) on the vast changes coming to the paper in a difficult time, so I know of what they are capable. I owe a debt of gratitude to former interns and dear friends (Stefanie Dazio, Sam Hogan, Sam Raphelson and especially Rachel Karas) who encouraged me to apply; to the SOC professors who recommended me (Amy Eisman, Rick Rockwell and Richard Benedetto); to SOC Dean Jeff Rutenbeck, Washington Post Metro editor Vernon Loeb (who I’m sad to say will be gone by the time I get there), Sharon Metcalf, Marvin Anderson, and the rest selection committee and SOC staff who run the Dean’s Internship program; and to my friends and family who put up with my insanity throughout the application process. A few weeks ago I went to a Costa Rican presidential debate in San José. When I got back to the states, I wrote, recorded and edited my first international piece and my first piece for Latin Pulse I’ve done in months. It’s also the first time leading the weekly news program. I also snagged a couple of photos of the candidates present. This is an important report for me. Majoring in international studies was my way of preparing me for a life of international politics reporting. I’ve also invested myself in radio reporting with work at Latin Pulse as well as PBS MediaShift. The fact that this piece exemplifies both is particularly significant in my professional development. Hopefully this is not the last.